Yotam Ottolenghi’s cookbook Jerusalem broke new ground with fantastic flavor combinations and inventive dishes that were at once exotic but approachable and appealing. The recipes blended different culinary traditions in a way that is fresh and exiting. Like so many people, I marveled that every dish I made from the book was fantastic. 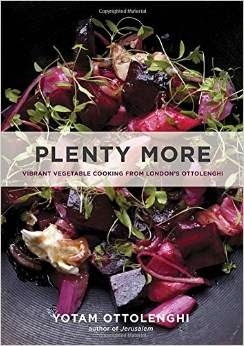 Plenty featured vibrant vegetarian recipes from his restaurant, Ottolenghi. Plenty More focuses again on vegetarian cuisine, with a dazzling array of creative ideas organized by techniques such as roasted or blanched. Consider the Tomato and Roasted Lemon Salad with sage, mint, pomegranate seeds and red onion, Zucchini Baba Ghanoush or Cauliflower Cake or Eggplants with Crushed Chickpeas and Herb Yogurt. I want to make practically everything in this book, and so will you. If you loved Jerusalem or Plenty, you will love this book too. It would make an excellent gift for vegetarians and omnivores alike. A few years ago I heard Aglaia Kremezi speak at Worlds of Flavor at the CIA in Napa. She was talking about the diet of people on a Greek island and the kinds of wild greens they ate. It was fascinating. 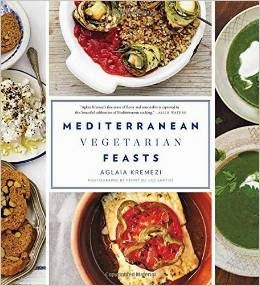 So I’m very happy to tell you about her latest book, Mediterranean Vegetarian Feasts, in which Kremezi admits to unwittingly being mostly vegetarian. The book has basic preparations and techniques for how to prep, cook and store ingredients like leafy greens, eggplants and peppers, tomatoes, fresh herbs and zucchini and squash. The recipes are divided into meze and salads, soups, main courses, breads and biscotti as well as some desserts. The recipes come from all over the Mediterranean, there are recipes for Greek Skordialia, Tunisian Chickpea Soup, Linguine with Spicy Lentils and Caramelized Onions and Spinach, Herb and Feta Skillet Pies. Each recipe is labeled so you can quickly find the ones that are vegan or gluten free. Some, like Quince Stuffed with Wheat Berries, Nuts and Raisins are more inspired than strictly traditional. But these are easy to follow and gorgeously photographed by Penny De Los Santos. 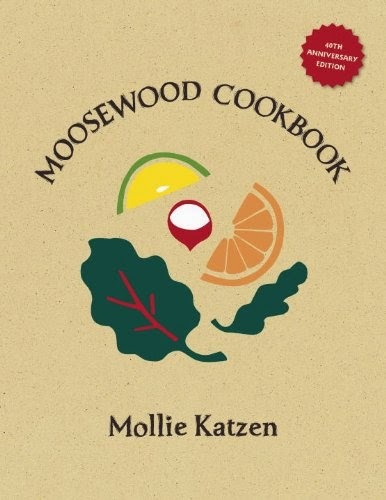 I know what you're thinking, Moosewood Cookbook is not a new book! And you're right. It's the 40th anniversary edition of a landmark vegetarian cookbook. The book has so many "classic" recipes it's a go to source for things like gazpacho, pesto, mushroom moussaka, crepes, spanikopita--the book was already a classic when I was in college but I used it a lot back then and my copy is dog eared. Some of the recipes are updated in ways that make sense in terms of how we eat today such as lowering the amount of butter or using fresher ingredients. But for the most part the recipes are just as they always were. The recipes are easy to follow and easy to make. There is no kale, no couscous, no quinoa. But is it still worthwhile? I'd say yes. This is not trend setting stuff, but it will feel nostalgic for many, me included, who discovered vegetarian food in the 70's or 80's. 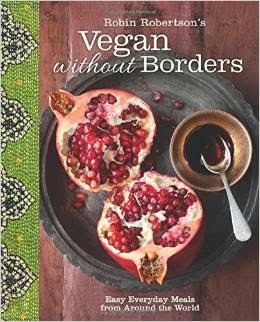 Vegan without Borders, subtitled easy everyday meals from around the world is written by a veteran vegan cookbook author, Robin Robertson. In it she takes some traditional recipes and makes vegan substitutions for example tofu stands in for feta cheese in a Spanakopita Tart. Many of the dishes are appealing, like Black Eyed Pea Fritters, Eggplant Satays with a peanut sauce and Papri Chaat served wit ha variety of toppings. I’m generally not a fan of vegan substitutes for things like sour cream, yogurt but as far as I can see Robertson avoids the dreaded faux cheese. There are a lot of tofu and seitan recipes in this book. The photos are gorgeous and the recipes are well written and easy to follow. If you are looking for a vegan cookbook with more sophisticated recipes this is a good pick. Personally I’d still rather go with vegetarian rather than vegan versions for many of the recipes featured, but that’s just me. This book has a lot more mainstream appeal than most vegan cookbooks and isn't in any way preachy.